02. Is That A Line? 03. Why Can’t It Happen To Me? 05. What Have You Been Doing? -WOMB KX07: Phillip and his Foetus Vibrations: “(Tell Me) What is the bane of your life?” 7 inch E.P. 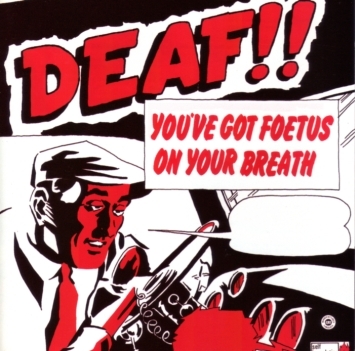 -WOMB OYBL 2: You’ve got Foetus on your Breath L.P.
-WOMB 6T33: “Foetus on the Beach” Triple L.P. THIS IS A CLASSICAL QUALITY PRESSING. All songs composed by Thirlwell © 1981. Face A: FOETUS MEETS THE ICONOCLAST = SLUNK ROC : RHYTHMIQUE! Face B: SELF IMMOLATION ENDORSE HARLAN COCKBURN : EXTRAORDINAIRE! LP limited to 2,000 copies, and did not come with a lyric sheet or any other type of insert. “Today I Started Slogging Again” also appears in edited form on the Hole release, the Wash / Slog 12″, the Sink release, as well as a John Peel radio show done in December 1982 (available as a bootleg item).